Introduction: To reduce recurrence large hiatal hernias are commonly repaired with mesh. 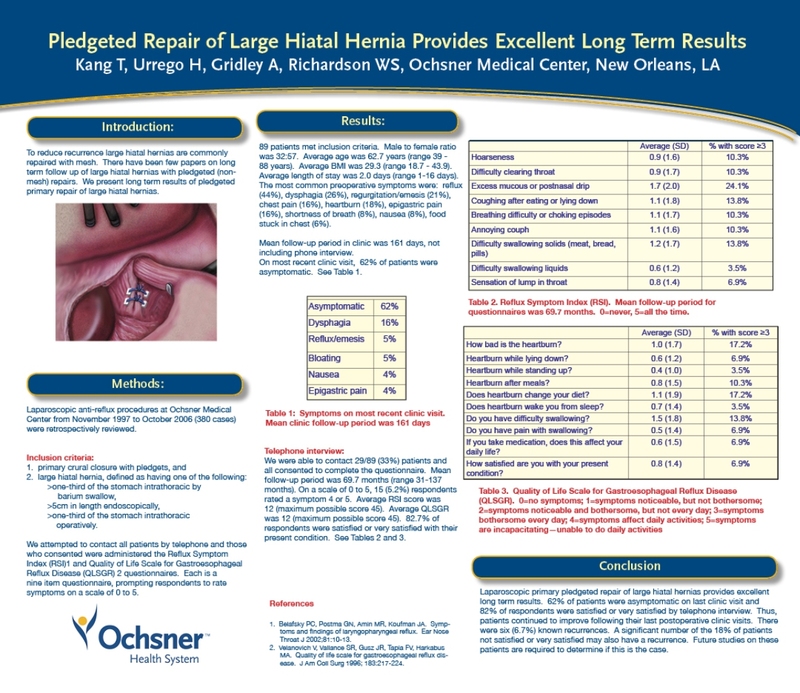 There have been few papers on long term follow up of large hiatal hernias with pledgeted (non-mesh) repairs. Methods: All laparoscopic anti-reflux procedures done at Ochsner Medical Center by a single surgeon from November 1997 to October 2006 (380 cases) were retrospectively reviewed. Inclusion criteria were: primary crural closure with pledgets; and large hiatal hernia, defined as: having greater than one-third of the stomach in the chest by barium swallow, greater than 5cm in length endoscopically or greater than on third of the stomach in the chest operatively. We attemted to reach all patients who met inclusion criteria for telephone interview. Those who consented were administered the Modification of Reflux Symptom Index and Quality of Life Scale for Gastroesophageal Reflux Disease questionnaires for long term follow up. Results: Chart Review: 89 patients met inclusion criteria. Male to female ratio was 32:57. Average age was 62.7 years. Average BMI was 29.3. Average length of stay was 2.0 days (range 1-16 days). Mean clinic follow-up was 161 days. The most common preoperative symptoms were reflux (44%), dysphagia (26%), regurgitation/emesis (21%), chest pain (16%), heartburn (18%), epigastric pain (16%), shortness of breath (8%), nausea (8%), food stuck in chest (6%). On most recent follow-up, 62% of patients were asymptomatic. The most common postoperative symptoms were dysphagia (16%), reflux/emesis (5%), bloating (5%), nausea (4%), epigastric pain (4%), heartburn (3%), cough (3%), chest pain (2%), abdominal pain (2%). There were six (6.7%) recurrences on EGD or upper GI. Average time to recurrence was 24.5 months. Five patients with recurrence had symptoms noted on their most recent follow-up visit. Telephone interview: 29/89 (33%) of patients completed the questionnaire with a mean follow-up of 69.7 months (range 31-137 months). Average Modification of Reflux Symptom Index score was 12 (maximum possible score 45). In six of nine categories, average score was less than 1 (possible score 0 to 5). Using scores of 3 and above to define significant symptoms, 17.2% of respondents had significant heartburn, 17.2% had diet-changing heartburn, and 13.8% had difficulty swallowing. Average Quality of Life Scale for GERD was 12 (maximum possible score 45). Using scores of 3 and above to define significant symptoms, 24.1% of respondents had significant excessive mucus/post-nasal drip, 13.8% had coughing after eating or lying down, 10.3% had breathing difficulty, 10.3% had annoying cough, and 13.8% had difficulty swallowing solids. In response to satisfaction with present condition, the average score was 4.34 (maximum score 5). 82.7% of respondents were satisfied or very satisfied with their present condition. Conclusions: Laparoscopic primary repair of giant hiatal hernia provides excellent long term results. 62% of patients were asymptomatic on last follow-up and 82% of respondents were satisfied or very satisfied. Recurrent hiatal hernia rate was low but not all patients were studied.